I never add pictures to my posts. What the hell? That’s boring and something that needs to be changed. Too much cold medicine makes you do weird things. 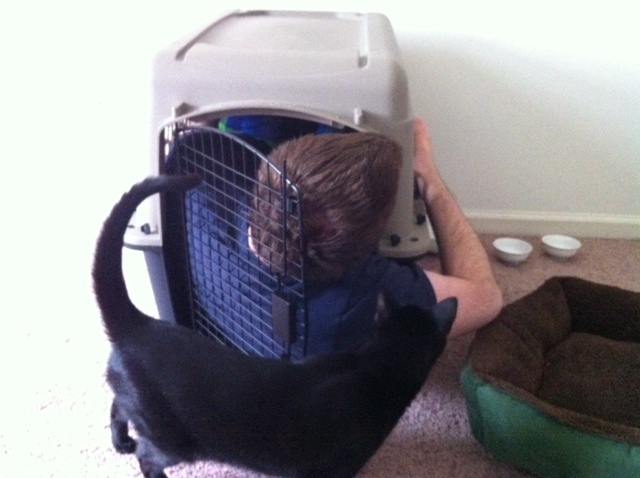 So… here’s a picture of my husband trying to shove himself into a pet carrier. Why, you ask? Because why the hell not. Ahhhh! That was funny. By the way, you just gave me a brilliant idea. I’m catching a cold ASAP! If you know what I mean. Cute! Makes me feel like catching a cold too. Superb. So so funny. Add more pictures, I love them. I bet the cat thinks it gets the bed now that dad took the carrier! I often put an Airborne tablet into Chardonnay. Yummy and good for a cold. Whoa. Now this is a tip I can get down with. I’ve pounded some Nyquil in my days (often with a double-bourbon chaser), but never so much to put me into the cat’s crate. Hope you feel better or at least more sane very soon! Didn’t think of that. She hates it in there, and is pretty demanding and vengeful, lol. Hlarious! How odd it is, that this is exactly the sort of thing I would do . . . I love your writing style. You’re so funny!